YOUR INTENSIVE CARE HOTLINE - My Husband Showed Great Improvement in Trying to Wean Him Off the Ventilator. Why Can’t He Be Totally Removed from It? My Husband Showed Great Improvement in Trying to Wean Him Off the Ventilator. Why Can’t He Be Totally Removed from It? My Uncle in the ICU Had a Stroke. Will He Be Able to Recover After Two Weeks in the Intensive Care Unit? In this week’s episode of “YOUR QUESTIONS ANSWERED“ I want to answer the succeeding questions from one of my clients Rebecca as part of my 1:1 consulting and advocacy service! Rebecca’s husband is in the hospital with tracheostomy and she is asking why he can’t be weaned off from the ventilator. Patrik: Hi, is this Rebecca? Rebecca: Yes, hi Patrik. How are you? Patrik: I’m really good. Thank you. How are you? Rebecca: I am very well. Patrik: Okay. If you can tell me more about your husband’s situation, and then I can tell you how we can help. So it’s really about making a decision going forward, how I can help you. So, tell me more about what’s been happening and what your frustrations are, and then we’ll take it from there. Rebecca: Okay, well my husband has been on his tracheostomy since January 24th, and he’s doing well, we are just trying to wean him off of the machine, but it just seems to be difficult. He’s at 30 hours, and then he started sweating very, very profusely. But now he’s been on a force of doing 10 hours a day. Patrik: 10 hours a day? Rebecca: Very, very well weaning him off, but today he did 10 hours, no he did six hours, and then he had an episode of that sweating. But I didn’t know that when you do a draw, a blood gas that you can get different results if they’re on SIMV, or if they’re on CPAP. Patrik: Oh very much so. Very much so. Rebecca: Yeah, I didn’t know that. So, last Sunday his blood gas on SIMV was 51, this past Friday they did a blood gas he was on CPAP, and it came back 113. Rebecca: So the only … Yeah, go ahead. Patrik: Can I just … And I will come to that blood gas CPAP versus SIMV, now the biggest problem for families in a situation like that is you don’t know, what you don’t know, the devil is in the detail, but I’ll come to that. Patrik: I mean, this is why there are specialists in Intensive Care because for me this is common knowledge, the blood gas on SIMV would be different compared to blood gas CPAP, that’s Intensive Care 101. You don’t know what you don’t know, that’s the problem, but let me ask you, tell me why your husband went into this situation in the first place? Just tell me a little bit more about why does he have a trache? What happened prior to him having a trache? Rebecca: Yes, he’s 83, believe it or not, but he looks like he’s in his 60s. So because they felt that he wasn’t breathing, they gave him a trache. And that’s how we got into this situation because of the pneumonia. Patrik: Right, and when did he have the stroke and the pneumonia? How much longer, when was that? Rebecca: Then on the 24th, yeah I think it was the 21st they said that he needed to have a tracheostomy. Rebecca: So then we did the trach. Patrik: Right. Okay. Where is your husband at the moment? Is he in LTAC or is he still in Intensive Care? Rebecca: He’s in … What’s LTACF? Patrik: Long Term Acute Care Facility. PODCAST: ICU WANTED TO TRANSFER MY DAD IN THE LTAC FACILITY BUT I WAS ABLE TO KEEP HIM IN THE ICU. YOUR PROFESSIONAL CONSULTING AND ADVOCACY DID HELP ME A LOT! Patrik: Okay, as far as I’m aware, there are no Long Term Acute Care Facilities in Wisconsin, as far as I’m aware. Rebecca: Okay, so then this would be Short Terms. Rebecca: So if they can’t wean him … Right, they would put him in a nursing home. Rebecca: Or a place that would help him with the trache. Yes. Patrik: Right, so at the moment you are still in a hospital? Rebecca: No, he’s in a regular room. Rebecca: And something else I wanted to tell you Patrik, he’s doing well because when we put the speaking valve in, and we use the speaking valve, he’s not connected to the machines, so he does the speaking valve for about five to 10 minutes then. Rebecca: He needs no help. Rebecca: So I feel he can be weaned off. But my concern is why isn’t happening. Patrik: Well that would be why I’ve been telling you why is it not happening. Rebecca: Yeah, I’m really not getting any answers as to why it’s not happening. That’s what has me so puzzled. Patrik: Okay. Let me ask you the follow, so you mentioned your husband has 10 hours a day off the ventilator, and he’s managing well. Patrik: Right. And they put him back on the ventilator/ breathing machine over night? Rebecca: Well, he did overnights this past weekend. He did 10 hours. Rebecca: It started at 20. Yeah they started at I believe it was 11:20 and he stayed on that until about 10:00 the next morning. Rebecca: Which surprised me because … Which surprises me perhaps just because he has sleep apnea and he has COPD, and he’s doing very well, he didn’t have any hiccups. Patrik: How many days … When was the first time he had time off the ventilator? Even if it was only five minutes, when was the first time? HOW LONG DOES IT TAKE TO COME OFF A VENTILATOR/ RESPIRATOR IN INTENSIVE CARE? HOW TO WEAN OFF VENTILATION AND TRACHEOSTOMY STEP BY STEP! Rebecca: He’s been doing good with the ventilator, today he did six hours, and then he started that sweating episode. Patrik: Four weeks ago, six weeks ago? Two days ago? Patrik: That he came off the ventilator for the first time. Rebecca: No, we haven’t done the coming off the ventilator, you mean totally? Rebecca: Like with the T-piece? Patrik: Yeah, with the T-piece. Rebecca: No, we haven’t even gotten that. No, we haven’t gotten to the T-piece. Rebecca: That’s my problem. That’s what I want. Patrik: So at the moment he’s basically going back and forth between CPAP and SIMVs is that what you’re saying? Patrik: Okay. Yeah. Now I understand. My understanding was he had time on the T-piece already. Okay. That’s okay. Patrik: Right. Okay. Let me ask you this, are they, for example, mobilizing your husband, is he getting out of bed regularly? Rebecca: I don’t even know. They keep saying he’s not, what’s the word, he’s lethargic. He’s not. Rebecca: I mean he’s talking, he’s conversing everything. He is not getting physical therapy, and I think that would be the best for him to have physical therapy, getting up, getting out, but he does have a bed sore. Patrik: He does have a what? Patrik: Oh, well I’m not surprised, if he’s not getting out of bed, he would be getting a bed sore sooner or later. Rebecca: That’s been bothering him, but it’s healing pretty good. Patrik: Okay, well it would heal better if he was getting out of bed, that’s for sure. Rebecca: Right so I should push the issue to make them give them physical therapy, I know that. Patrik: Who is in charge, or let me ask you differently, he’s had a mini stroke, when you’re saying, they have the speaking valve on every now and then, when he’s talking he’s making sense? He’s oriented, all of that? Rebecca: Yes. Yes. He wants to eat. The first thing he says, he wants to eat. Rebecca: He’s very aware of where he is. Patrik: Right. Okay. No, no that’s great, and who is in charge of the ventilator weaning? Who is it, is it the respiratory therapist, does he have a pulmonologist? Who’s in charge of the ventilator? Rebecca: He has a pulmonologist. Patrik: Okay. And do you think that this person is taking ownership of the weaning? Rebecca: He is, and I think he’s moving slow, but I don’t want to be presumptuous, and overrule him, but I feel he’s not moving fast enough. Patrik: Well, would you say that this has been your road blocks that he’s not moving forward fast enough? Rebecca: That’s my personal opinion, yes. Patrik: Right. Do you have any feeling why they might delay, can you sort of point your finger towards anything in particular? Rebecca: No, as to why? Rebecca: I know that I’m very adamant, and I’m very concerned about what I want to do, and what I feel should be done, I speak about that, yes. Patrik: So you should. So you should. I mean, this is what I refer to a once in a lifetime situation. You don’t want to get it wrong. Patrik: Are you the medical power of attorney for your husband? Patrik: Okay. That helps. That helps. Have they have given you any timelines around how long it might take? Rebecca: No, but I think I’m going to start asking when is the timeline because now it seems like the doctor is making it seem like he can’t be weaned. Rebecca: He’s giving me that impression, he can’t be weaned, but why can’t he be weaned, and we haven’t even tried the T-piece yet? Patrik: Absolutely, absolutely. When or how long ago did your husband leave intensive care? How long ago was that? Rebecca: Let’s see, he left Intensive Care February 1st. Rebecca: And then he got moved to this facility February 3rd I believe. Rebecca: I’m going by memory. Patrik: Right, but that’s in the same hospital, you didn’t go in a different hospital, it’s the same hospital. Rebecca: Yes. No, we went to a different hospital. This hospital is supposed to specialise in weaning patients off of CPAP, I mean off of the machine. Patrik: Okay. Okay. Were you given any choice then going from ICU to this hospital? Rebecca: No, I wasn’t given any choice. It was made like I had to do it because the hospital is not Long Term. Rebecca: The hospital they said is more for sick patients and because he had the pneumonia, he needed to go some place for them to wean him off the machine. Patrik: And what’s the level of care he’s currently getting? Is he getting care with Intensive Care nurses, with a respiratory therapist, who are the caregivers, what’s their sort of level of expertise? Do you know? Rebecca: No. Because there’s so many doctors here Patrik, my head is spinning. He has the stomach and the intern doctor, he has respiratory therapist, he has a pulmonologist, he has the primary, the kidney doctor, I mean there’s so many doctors, and so I’m just … So confused, but I write everything own, I’ve been keepin’ a diary, I write everything down. I’m trying to get some with the doctors, and being very boisterous in my concerns. Patrik: Good. And so you should. and so you should. Do you feel like, again I keep coming back to the pulmonologist probably, so you don’t feel like he’s pushing hard enough, he or she, pushing hard enough? Patrik: Right, is there any consistency with other care givers like nurses, respiratory therapists, is there any consistency? Rebecca: They seem to be consistent, but everybody just seems to be nonchalant. Rebecca: They’re doing their job, but they just seem to be just doing what they supposed to do. Patrik: But not more than that. Rebecca: Right because I feel he should be getting physical therapy, getting out of bed that would be strengthening his lungs, if he was getting speech therapy. You need to do more, he just lays here day in and day out. Rebecca: It should be more to help him wean off his machines. Patrik: Absolutely. Okay. For example, the nursing staff that are looking after him, do you know how many other patients they would be looking after on a shift? The ICU wants my to remove my wife’s trache and they want to transfer her to the LTAC. Will it be safe for her? My mother in the ICU is unable to come off the ventilator. Is giving sedation and doing a tracheostomy going to help her? My Dad in the ICU is having airway swelling. 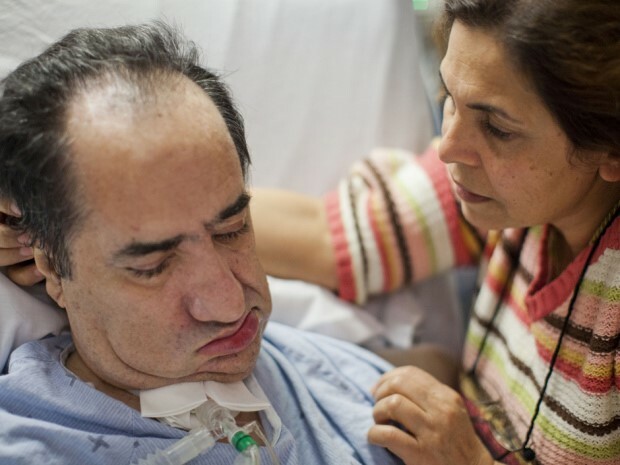 How come the ICU team is rushing him to have a tracheostomy? My Husband In The ICU Is Doing Better? Why does the ICU team push towards Withdrawal of Treatment? My Uncle in the ICU is in a Critical Condition. Why Does the ICU Team Opt for Euthanasia?